How do you write this with a straight face? Russia’s wide-ranging disinformation attack on the 2016 US election even used Pokémon Go as part of its effort to minimize African American voter turnout, according to a report commissioned by the Senate Intelligence Committee. The study, authored by a Columbia University professor and private sector researchers, found links between a YouTube account run by a Russian troll farm and a Tumblr post encouraging Pokémon Go players to name their Pokémon after police brutality victims. 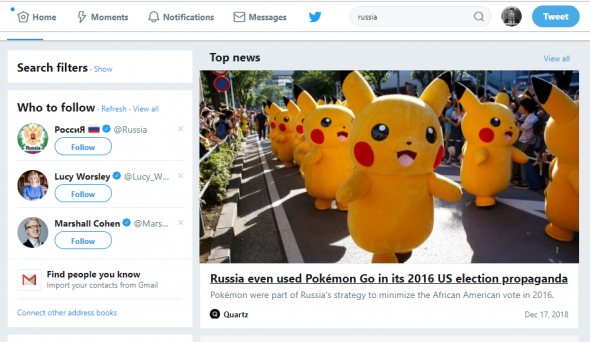 The study…found links between a YouTube account run by a Russian troll farm and a Tumblr post encouraging Pokémon Go players to name their Pokémon after police brutality victims. Interestingly, a quick Google search shows that this story is over a year old. Why is it getting recycled again?